Off-Grid in Alaska: 9-30-09: Bunnies! Sorry for the grainy pic folks, but the wildlife really gets active at dusk and my camera doesn't like the light conditions. 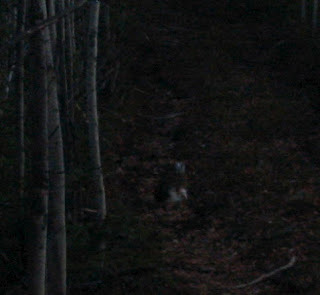 Anyway, it's a gigantore snowshoe hare that has started turning white for the winter... ears, tail and feet are white, but the body is still gray-brown. We literally have hundreds of these guys around our property. I had a disturbing Alfred Hitchcock moment the other day when crawling around under the deck and felt something watching me, only to turn my head and find about 10 of these critters lined up at the edge of our clearing just staring at me. Creepy. If I hadn't been under the deck, I would have grabbed my .22 rifle and had some fresh hare stew for dinner... ah, maybe next time. So far, Sonja has 6 kills (all inedible of course) and we have none. But there are plenty of spruce hens and ruffled grouse, as well as the hares, on our property... so one of these days we'll get around to plinking off a few. That is if the HUGE horned owl that lives on the corner of our lot doesn't pick them all off first... he got the ermine that was nosing around the tent the other day. Needless to say, we don't let Charlie out on the deck after the sun starts setting!! Very, cool, you guys . . . I'm envious of your abundant wildlife!